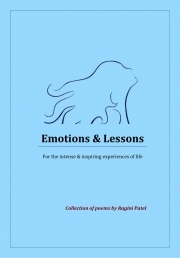 Description of "Emotions & Lessons (eBook)"
One evening, while in retrospection I looked at many of the sweet and bitter memories of past and realized how life goes on as we continue to evolve and how with different thinking the same incident takes different meaning! That evening’s thought process encouraged me to re-visit the poems I wrote over a period of time and write new ones. My motivation behind sharing them through this book is belief that we as humans have the power to change the consequences of every happening in and around us just by the way of our thinking. The book has a collection of 49 short and long poems spread over 64 pages. I believe that the readers will be able to connect and find their own reflection in them. Ragini Patel is an M.Tech. from Indian Institute of Technology, Bombay. She works as a Researcher and Algorithm Developer. However writing is a choice to speak what could not be said otherwise. Reviews of "Emotions & Lessons (eBook)"
masterpiece ! wonderful and genius writing.. straight from the inner core ..A journey from an innocent gentle complaining one to someone understanding enlightned and at peace with self .emotions of some one yearning to be heard and understood..sometime complex sometime innocent..great to read.. the poem 'wishes' is very touchy. All the best to the young author.